Zori (mom) was in the care of NASPR when she whelped her litter of (5) pups on November 16th, 2013. Although mom is a Shar-Pei, her babies are Shar-Pei mixes. All pups are healthy, have been afforded veterinary care from birth to date, have had dew claws removed and will be spayed/neutered and complete their vaccinations before going to their forever homes. Pups have been raised w/mom in a home environment where they have been lovingly handled, socialized and worked w/since birth. Please don't tell them that they are mixes as they believe and behave as if they are purebred Shar-Pei. Applications are now being taken/processed for homes wanting to make one of these babies a part of their family. 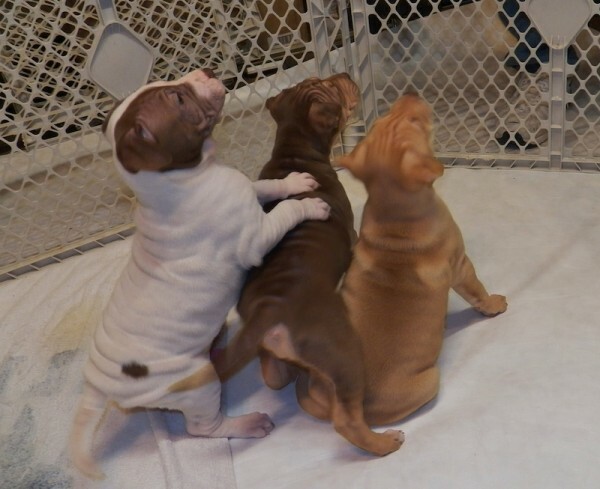 Three of the five are still available for adoption. See individual pups under Brûlée, Monkee & S'more.